N64 Super Mario 64 (USA) in 05:33.85 by SilentSlayers & Johannes. At first there were 70 stars because Bowser demanded it. Then there were 16 stars because MIPS the rabbit demanded it. Then there was 1 star because Bowser's Sub demanded it. Now there are none because the viewers are impatient and demanded the game be quicker. As with many other runs on this site, the goal of pure speed has resulted in the complete breaking of the game. Very little of the game's normal play remains. 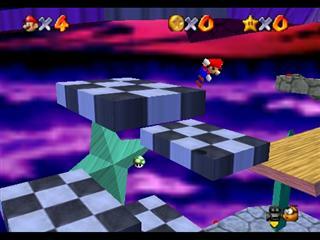 If you'd like to see more of what Super Mario 64 offers, see the 120 stars run. This movie is approximately a 6 second improvement to the previous movie due to a series of improvements discovered by the authors, detailed in the submission message. Super Mario 64 has a history of publications on this site. If you wish to see how it unfolded since the beginning, see the page SM64TASHistory. Also, if you have a hankering to see MIPs the rabbit, the 16 stars route has been improved.